on view from Feb. 14 to the end of May. 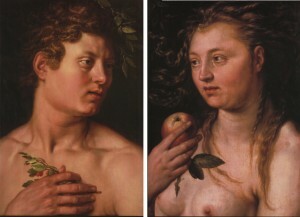 Timothy Liu’s poem refers to Dutch master Hendrick Goltzius’ panels Adam and Eve, painted in the early 17th century. The paintings were briefly reunited for an exhibition at the Museum of Fine Arts of Strasbourg in the spring of 2010, after over a century apart. Image courtesy of The Wadsworth Museum.